Well, b/c I've got a good barber I thought it would be a good thread. Dave is in a 2 chair shop.12$ I've never been in a shop w/4 people waiting on one guy. The other barber will be open, but everyone waits for Dave. I don't know if the other guy gives a bad cut...I think in the past year I've only seen him cutting once or twice...I think Dave is just good. 15mins, a bit of positive chatter, "How'sit go'n boss" He's young guy, gives a tight cut, w/hot lather & razor neat'n up on the sides and neck. All good. Gotta love a good Barber. It really makes the experience pleasant. I love my barber, he grew up and went to school with my mother and he has been cutting my hair since my very first hair cut. His shop is also a small 2 chair shop, shelves loaded with old glass bottles of tonics and aftershaves, a 50 year old Coke machine filled with good old glass bottles of soda colder than a penguins tookus. He refuses to put a tv or radio in the place, preferring to talk or sing. I believe that is my favorite part, he has a wonderful voice but doesn't actually sing, it's more of a melodious humming and is soooo relaxing. 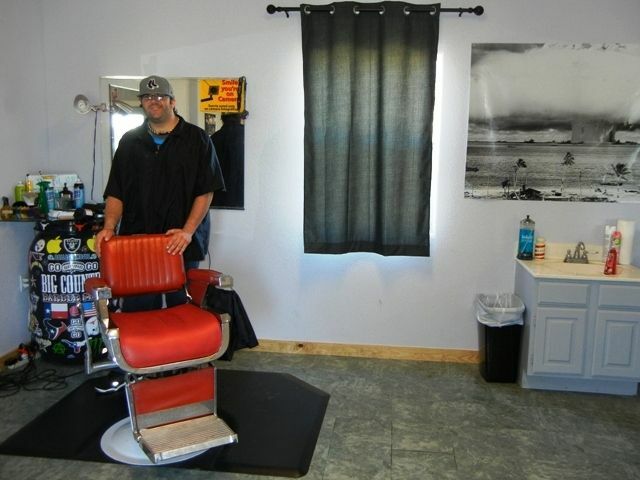 He only charges $8 for a cut and $6 for a shave and is there mostly for enjoyment and the love of his customers, he even said he doesn't need the money anymore and hasn't for at least 20 years, he just loves it and says what would I do otherwise, sit at home on my bum? He is getting up there in years, about 80 I believe, I worry who I will go to if he ever closes shop....there are other barber's of course, but it just won't be the same. All the barbers in my area have retired. Nothing but lady stylist now. Sad, sad, sad. 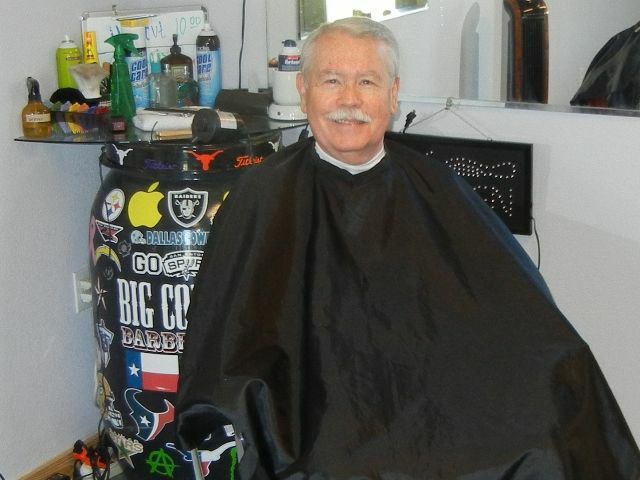 I sure do miss going to the barber with my dad! Haven't needed to go for some time now since I started losing my hair! Too bad! (10-23-2013, 05:14 PM)Arcadies Wrote: I love my barber, he grew up and went to school with my mother and he has been cutting my hair since my very first hair cut. His shop is also a small 2 chair shop, shelves loaded with old glass bottles of tonics and aftershaves, a 50 year old Coke machine filled with good old glass bottles of soda colder than a penguins tookus. He refuses to put a tv or radio in the place, preferring to talk or sing. I believe that is my favorite part, he has a wonderful voice but doesn't actually sing, it's more of a melodious humming and is soooo relaxing. Yes, the "old" barber still owns this shop and stops in once in awhile. He is a heavy man and his feet can't take standing any more. He has given cuts in this area as long as I've been alive. It won't be long before all the old barbers around here are also gone, I know two who still give a straight shave (unofficially because it's no longer allowed), all the rest are modern salons. We got lucky here in Devine. One of our local young men decided to go to Barber School and open a shop here. I was having to drive up the road to Natalia for a cut. Justin has been cutting my hair for just over a year now. He does a good job and knows his way around a straight. Up to now it has just been on the sideburns and neck, but next trip is a full shave along with the cut. I was just there yesterday. If I ever get down to the San Antonio area I will pay a visit to Devine and visit Justin. I will also bring him a Brewers hat. My first memories of a barber shop was going with my father on a bus to his old neighborhood. I always thought it was his idea to take me there for a father son outing. It was only years later that I realized it was my mother who made him take me. If he had me with him he couldn't get into the poker game that was always going on in the back room. I remember walking in and to the right was a manicurist. My father disdained her. He said only pimps, bookmakers and dandies got manicures. To the left was a boot black. I never really remember anyone getting a shine from him. He always seemed to be asleep sitting in one of the high chairs on his stand. In the back of the store near the payphone sat the local bookmaker. He was a man deserving respect. He always gave me a piece of licorice when we visited. Then there was the famous backroom with the poker game. My Uncle Max could always be found there. I don't think my uncle ever did have a real job. There were 2 barber chairs, mirrors a big round stainless hot towel steamer with a gas flame under it and and strops attached to each chair. I would sit and watch my father get a haircut and shave and eat my licorice. Every once in a while I would be lucky enough to get a haircut as well. The barber would put a little seat across the handles of the barber chair and I would climb up into the seat. The best part came after the haircut. The barber put warm shaving cream behind my ears and the back of my neck. Then he stropped the razor using the strop that was attached to the chair and shaved my neck, sideburns and behind my ears. Then came the best part he would put witch hazel on the freshly shaved areas. It was just like my father's shave. Finally, my father and I went to an ice cream parlor near the bus stop. We would have ice cream and then ride home on the bus together. No wonder to this day two of my favorite loves are shaving and poker. (10-24-2013, 09:21 AM)Barrylu Wrote: My first memories of a barber shop was going with my father on a bus to his old neighborhood. I always thought it was his idea to take me there for a father son outing. It was only years later that I realized it was my mother who made him take me. If he had me with him he couldn't get into the poker game that was always going on in the back room. I've been going to the same barber for 18 years now. I think I found him on about the 3rd haircut after we moved to the Minneapolis area. He has shop decorated with pheasant hunting and Harley Davidson themes and even parks his Harley in the back room. Business has been on a steady decline for him for 10 or 12 years and having to move locations (so a CVS could be built at the old location) didn't help. From the sound of it, he gets a few new clients every year but not enough to make up for those dying off or moving away. I've started taking my two boys there, even though it's a 20 minute drive from home (it's near my office). (10-24-2013, 11:15 AM)5Savages Wrote: I've been going to the same barber for 18 years now. I think I found him on about the 3rd haircut after we moved to the Minneapolis area. He has shop decorated with pheasant hunting and Harley Davidson themes and even parks his Harley in the back room. Business has been on a steady decline for him for 10 or 12 years and having to move locations (so a CVS could be built at the old location) didn't help. From the sound of it, he gets a few new clients every year but not enough to make up for those dying off or moving away. I've started taking my two boys there, even though it's a 20 minute drive from home (it's near my office). Here on the east coast (I'm in Richmond Va) the barber shop seems to be making a bit of a comeback....so maybe business will pick-up. that have opened up in the last couple of years. The signage and the whole works on tap, it's a welcome sight and turn of events. I think that we will see a Barber Shop resurgence. In the Albany, NY area (which really isn't that big of a market) there are two great Barber Shops (that I know of) that are run and staffed by professional, highly-skilled, young barbers. One of those shops is called Patsy's (http://www.patsysbarbershop.com/) - I live about 35 mins away and will drive there to get my hair did. I highly recommend you stop in if you're ever in the Albany area. The other one is Duke's (http://www.dukesbarbershop.com/), and I've heard good things about it. And, just recently, a new Barber Shop opened right here in my hometown (Amsterdam, NY). I plan on stopping in to check it out this week. I've also gone to a few Barber Shops in NYC, Chicago, and elsewhere, that are run and operated by younger cats that appreciate and emulate the traditions of the old school barbers. So, I think there is hope. A few years ago I went to a barber on my birthday to get a cut and a shave. I wasn't too impressed at all. But just a week or two ago I went to another barber close to me (my wife cut my hair during that time) and had a wonderful time! They had 3 chairs and 3 barbers. I sat at the female barbers chair and in less than 20 minutes, of relaxation, I was done. I was waiting for her to bring out the little clippers to clean up my neck, but instead I heard a machine run and she lathered the back of my neck and hairline, then pulled out her straight and shaved my neck and hairline to clean it up. She did it so quick she was pretty much done by the time I knew what was happening!! IT WAS AWESOME! They also do shaves, so I think I know where I'm going for my birthday shave! I was happy to find out that there is a great low-key barbershop, with skilled barbers, close to my place. (11-23-2013, 08:21 AM)Lradke Wrote: A few years ago I went to a barber on my birthday to get a cut and a shave. I wasn't too impressed at all. But just a week or two ago I went to another barber close to me (my wife cut my hair during that time) and had a wonderful time! They had 3 chairs and 3 barbers. I sat at the female barbers chair and in less than 20 minutes, of relaxation, I was done. I was waiting for her to bring out the little clippers to clean up my neck, but instead I heard a machine run and she lathered the back of my neck and hairline, then pulled out her straight and shaved my neck and hairline to clean it up. She did it so quick she was pretty much done by the time I knew what was happening!! IT WAS AWESOME! That sounds like a winner and neck shave is goooood! That's awesome! Good for you for standing your ground and refusing to let her cut your hair. Even though it sounds like she wouldn't understand the lesson. We have a place here that calls itself a barber shop. Has the pole out front and everything. Go in an it is all women, and they are definitely stylists/beauticians, not barbers. Go down the street and take a left an you'll find the real thing.